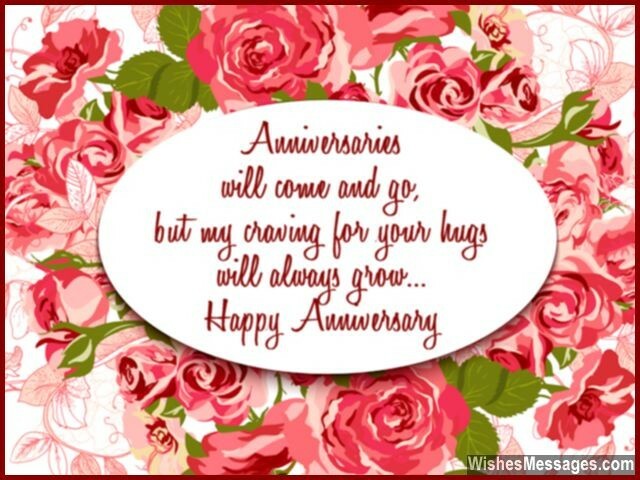 First Anniversary Wishes for Husband: Celebrate your 1st wedding anniversary by flooding your hubby’s Facebook, Pinterest, Twitter and cell phone with sweet texts, romantic quotes, funny notes and cute greetings. Don’t just say I Love You when you wake up in the morning. Write a heartfelt message on a handmade card and sneakily put it inside his pockets. He’ll get the best surprise when he puts his hands inside. You may not realize this right now but you will dearly miss these first couple of years of your marriage once the responsibilities of children and mortgage heave onto your shoulders. Enjoy each and every moment of this special day. Make sure that this milestone celebration becomes a beautiful memory which you can cherish for a lifetime. 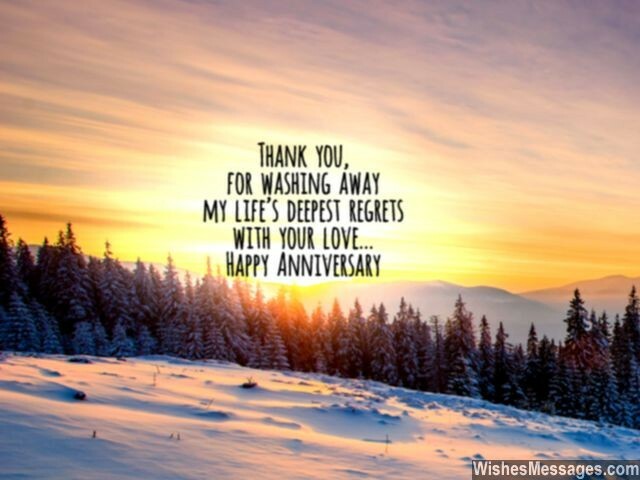 1) Thank you, for washing away my life’s deepest regrets with your love. Happy anniversary. 2) This day marks one whole year of our beautiful union. I am glad I married a man who is one in a million. Happy first anniversary. 3) I cherish the warmth of being wrapped, in the love given by you. The first year was magical, and the rest will be the same too. Happy anniversary. 4) Every single moment in the last 365 days have confirmed my belief that I am married not just to the right man, but to the perfect man. Happy 1st anniversary. 5) The first year of our married lives has been so happy and beautiful, for which I take full credit for being a loving wife. Now I pass on the baton and give you the responsibility to make the rest of our lives beautiful by being a good obedient husband. Happy 1st anniversary. 6) Life is full of reasons to be happy but I don’t need them. 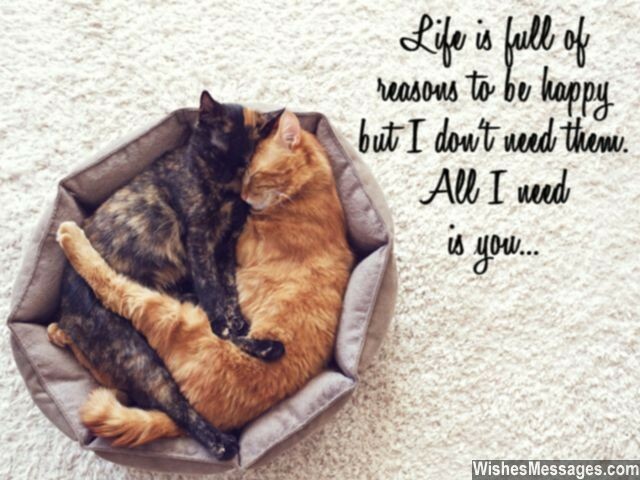 All I need is you. Happy anniversary. 7) For some, take ages to find true happiness. I found mine in just one year. Happy anniversary sweetheart. 9) Our first anniversary is like a delicious starter in the elaborate menu of the rest of our lives. Wish you a yummy one! 10) Our first anniversary is testimony to the fact that proposing to me was the best decision of your life… and accepting your proposal was the best decision of mine. I love you. 11) A lot of people have misunderstood me but I don’t care. All I want is for you to know that I love you, and nothing else matters. Happy anniversary. 12) Our First anniversary – the moment when both of us can start showing our true colors as the gloves finally come off. Good luck. 13) You have been an awesome husband throughout the first year of our marriage. I hope you plan to maintain these standards in the future too. Happy anniversary darling. 15) May our first anniversary set the scene for a romantic love saga which unfolds in its true glory in the years to come. Happy anniversary. 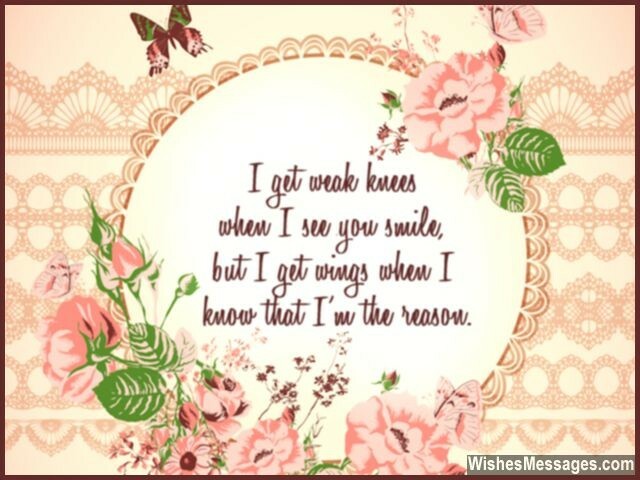 16) I get weak knees when I see you smile, but I get wings when I know that I’m the reason. Happy anniversary. 17) This is not just a wedding anniversary, but also a reminder of all the beautiful promises we’ve made to each other. Happy anniversary. 18) If the first year of marriage is supposed to be a tell tale sign of how the rest of a couple’s life is going to be, ours is going to be beautiful and awesome. Happy anniversary, I love you. 19) I don’t think I’ll ever need a vacation – because every day of our life feels like a honeymoon. Happy first anniversary. 20) One year has passed so quickly and I don’t even know how. Maybe because I have never had so much fun in my life until now. Happy anniversary. 22) Over the last one year I have realized that marriage is not just about love, hugs and cuddles but it is also about fights and arguments. But even fighting and arguing with a sweet husband like you… feels like a cute thing to do. Happy 1st anniversary. 23) With the rate at which we’re making priceless memories, we’ll need at least a couple of more lifetimes to let them soak in. Happy 1st anniversary. 24) In the first year of our marriage, life has given me a crash course on how to be happily immersed in the beauty of love. I love you, happy anniversary. 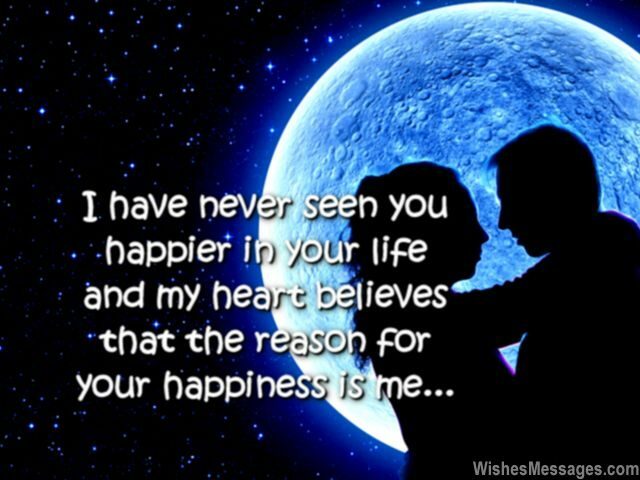 26) I have never seen you happier in your life, and I would like to believe that the reason for your happiness is me. Happy anniversary. 27) I could feel my heart beating faster when I woke up today morning. It had to be, because today is the first anniversary of our wedding. I love you, my darling. 28) Today is by far the most beautiful day in my life. But I know that many more such beautiful moments lie ahead in our lives as husband and wife. Happy 1st anniversary. 29) Our first wedding anniversary marks the first milestone of many other romantic ones that we are yet to experience in our beautiful married lives. Happy anniversary. 30) My diet and daily routine is incomplete without the most essential element of all – Vitamin U. Happy anniversary. 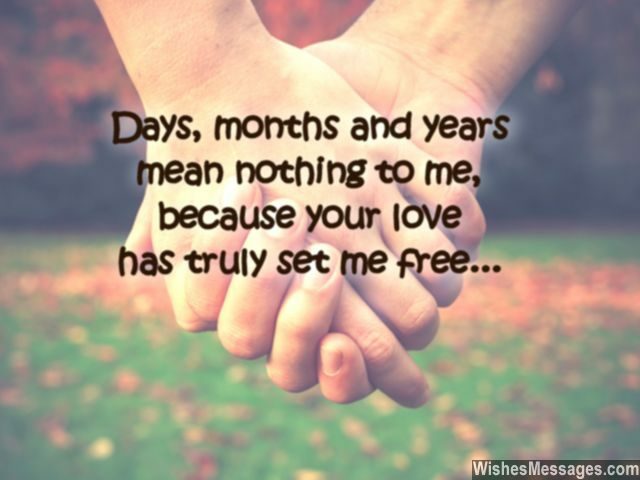 31) Days, months and years nothing to me… because your love has truly set me free. Happy anniversary. 32) I thought that our Wedding Day would be the best day of my life, but I was wrong… with you by my side, its Every Day. Happy 1st anniversary. 33) It may have just been a year since we got married, but it feels like I have I have been with you for a lifetime. I hope our married lives always remain so beautiful and serene. Happy anniversary. 34) One year of our marriage has passed in a jiffy… all because you’ve been an amazing hubby. Happy first anniversary. 35) From our friendSHIP to courtSHIP to relationSHIP – my life has been sailing in the best SHIP one after another. Happy 1st anniversary. 36) Not for a single moment, has our relationship been in a lull. With you around, not even a single day has been dull. 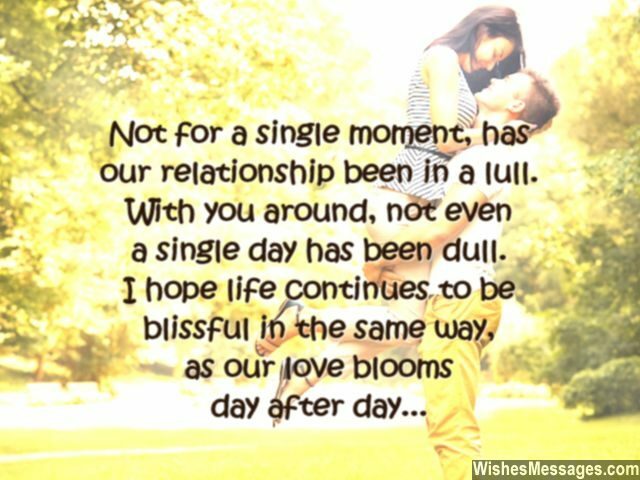 I hope life continues to be blissful in the same way, as our romance intensifies… day after day. Happy anniversary. 37) The first year of our marriage was full of exciting twists and turns and some unexpected ups and downs. In short, it was the best roller coaster ride ever. Happy anniversary handsome. 38) The last one year of our marriage has been the most perfect and flawless year in my whole life – all thanks to a wonderful man who I loving call my husband. Happy 1st wedding anniversary. 39) I thought marriages became boring after a few months. But you made me realize that ours is going to be romantic and exciting for the rest of our lives. Happy 1st anniversary. 40) The first year of our married lives was exquisite, and so will be the ones to come. I know that when you’re with me, my life will be nothing but awesome. Happy anniversary.